The runtime linker performs many operations including the mapping of objects into memory and the binding of symbols. Debugging programs often need to access information that describes these runtime linker operations as part of analyzing an application. These debugging programs run as a separate process from the application the debugger is analyzing. This section describes the rtld-debugger interface for monitoring and modifying a dynamically linked application from another process. The architecture of this interface follows the model used in libc_db(3LIB). When using the rtld-debugger interface, at least two processes are involved. One or more target processes. The target processes must be dynamically linked and use the runtime linker /usr/lib/ld.so.1 for 32–bit processes, or /usr/lib/64/ld.so.1 for 64–bit processes. 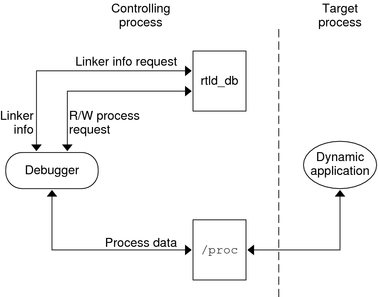 A controlling process links with the rtld-debugger interface library and uses the interface to inspect the dynamic aspects of the target processes. A 64–bit controlling process can debug both 64–bit targets and 32–bit targets. However, a 32–bit controlling process is limited to 32–bit targets. The most anticipated use of the rtld-debugger interface is when the controlling process is a debugger and its target is a dynamic executable. The rtld-debugger interface enables the following activities with a target process. Initial rendezvous with the runtime linker. Notification of the loading and unloading of dynamic objects. Retrieval of information regarding any loaded objects. Stepping over procedure linkage table entries. To be able to inspect and manipulate a target process, the rtld-debugger interface employs an exported interface, an imported interface, and agents for communicating between these interfaces. The controlling process is linked with the rtld-debugger interface provided by librtld_db.so.1, and makes requests of the interface exported from this library. This interface is defined in /usr/include/rtld_db.h. In turn, librtld_db.so.1 makes requests of the interface imported from the controlling process. This interaction allows the rtld-debugger interface to perform the following. Look up symbols in a target process. Read and write memory in the target process. The imported interface consists of a number of proc_service routines that most debuggers already employ to analyze processes. These routines are described in Debugger Import Interface. The rtld-debugger interface assumes that the process being analyzed is stopped when requests are made of the rtld-debugger interface. If this halt does not occur, data structures within the runtime linker of the target process might not be in a consistent state for examination. The flow of information between librtld_db.so.1, the controlling process (debugger) and the target process (dynamic executable) is diagrammed in the following figure. Note - The rtld-debugger interface is dependent upon the proc_service interface, /usr/include/proc_service.h, which is considered experimental. The rtld-debugger interface might have to track changes in the proc_service interface as it evolves. A sample implementation of a controlling process that uses the rtld-debugger interface is provided in the SUNWosdem package under /usr/demo/librtld_db. This debugger, rdb, provides an example of using the proc_service imported interface, and shows the required calling sequence for all librtld_db.so.1 exported interfaces. The following sections describe the rtld-debugger interfaces. More detailed information can be obtained by examining the sample debugger. An agent provides an opaque handle that can describe internal interface structures. The agent also provides a mechanism of communication between the exported and imported interfaces. The rtld-debugger interface is intended to be used by a debugger which can manipulate several processes at the same time, these agents are used to identify the process. Is an opaque structure that is created by the controlling process to identify the target process that is passed between the exported and imported interface. Is an opaque structure created by the rtld-debugger interface that identifies the target process that is passed between the exported and imported interface. This section describes the various interfaces exported by the /usr/lib/librtld_db.so.1 audit library. It is broken down into functional groups. This function establishes the rtld-debugger version requirements. The base version is defined as RD_VERSION1. The current version is always defined by RD_VERSION. Version RD_VERSION2, added in the Solaris 8 10/00 release, extends the rd_loadobj_t structure. See the rl_flags, rl_bend and rl_dynamic fields in Scanning Loadable Objects. Version RD_VERSION3, added in the Solaris 8 01/01 release, extends the rd_plt_info_t structure. See the pi_baddr and pi_flags fields in Procedure Linkage Table Skipping. If the version requirement of the controlling process is greater than the rtld-debugger interface available, then RD_NOCAPAB is returned. This function creates a new exported interface agent. php is a cookie created by the controlling process to identify the target process. This cookie is used by the imported interface offered by the controlling process to maintain context, and is opaque to the rtld-debugger interface. This function resets the information within the agent based off the same ps_prochandle structure given to rd_new(). This function is called when a target process is restarted. This function deletes an agent and frees any state associated with it. The following error states can be returned by the rtld-debugger interface (defined in rtld_db.h). The following interfaces can be used to gather the error information. This function returns a descriptive error string describing the error code rderr. This function turns logging on (1) or off (0). When logging is turned on, the imported interface function ps_plog() provided by the controlling process, is called with more detailed diagnostic information. You can obtain information for each object maintained on the runtime linkers link-map is achieved by using the following structure, defined in rtld_db.h. Notice that all addresses given in this structure, including string pointers, are addresses in the target process and not in the address space of the controlling process itself. A pointer to a string that contains the name of the dynamic object. With revision RD_VERSION2, dynamically loaded relocatable objects are identified with RD_FLG_MEM_OBJECT. The base address of the dynamic object. The base address of the data segment of the dynamic object. The link-map identifier (see Establishing a Namespace). If the dynamic object is a standard filter, then this points to the name of the filtees. These elements are present for backward compatibility and are currently unused. The end address of the object (text + data + bss). With revision RD_VERSION2, a dynamically loaded relocatable object will cause this element to point to the end of the created object, which will include its section headers. The base address of the padding before the dynamic object (refer to Dynamic Object Padding). The base address of the padding after the dynamic object (refer to Dynamic Object Padding). This field, added with RD_VERSION2, provides the base address of the object's dynamic section, which allows reference to such entries as DT_CHECKSUM (see Table 7-32). The rd_loadobj_iter() routine uses this object data structure to access information from the runtime linker's link-map lists. This function iterates over all dynamic objects currently loaded in the target process. On each iteration the imported function specified by cb is called. clnt_data can be used to pass data to the cb call. Information about each object is returned by means of a pointer to a volatile (stack allocated) rd_loadobj_t structure. Return codes from the cb routine are examined by rd_loadobj_iter() and have the following meaning. 1 – continue processing link-maps. 0 – stop processing link-maps and return control to the controlling process. rd_loadobj_iter() returns RD_OK on success. A return of RD_NOMAPS indicates the runtime linker has not yet loaded the initial link-maps. The runtime linker has loaded and relocated all the dynamic objects and is about to start calling the .init sections of each object loaded. The runtime linker has finished calling all of the .init sections and is about to transfer control to the primary executable. The runtime linker has been invoked to either load or unload a dynamic object. These events can be monitored using the following interface, defined in sys/link.h and rtld_db.h. The following functions track events. This function enables (1) or disables (0) event monitoring. Note - Presently, for performance reasons, the runtime linker ignores event disabling. The controlling process should not assume that a given break-point can not be reached because of the last call to this routine. This function specifies how the controlling program is notified of a given event. Depending on the event type, the notification of the controlling process takes place by calling a benign, cheap system call that is identified by notify->u.syscallno, or executing a break point at the address specified by notify->u.bptaddr. The controlling process is responsible for tracing the system call or place the actual break-point. When an event has occurred, additional information can be obtained by this interface, defined in rtld_db.h. There is no additional state information available. The link-maps are in a stable state and can be examined. A dynamic object is in the process of being loaded and the link-maps are not in a stable state. They should not be examined until the RD_CONSISTANT state is reached. A dynamic object is in the process of being deleted and the link-maps are not in a stable state. They should not be examined until the RD_CONSISTANT state is reached. The rd_event_getmsg() function is used to obtain this event state information. This function provides additional information concerning an event. The following table shows the possible state for each of the different event types. The rtld-debugger interface enables a controlling process to skip over procedure linkage table entries. When a controlling process, such as a debugger, is asked to step into a function for the first time, the procedure linkage table processing, causes control to be passed to the runtime linker to search for the function definition. The following interface enables a controlling process to step over the runtime linker's procedure linkage table processing. The controlling process can determine when a procedure linkage table entry is encountered based on external information provided in the ELF file. Once a target process has stepped into a procedure linkage table entry, the process calls the rd_plt_resolution() interface. This function returns the resolution state of the current procedure linkage table entry and information on how to skip it. pc represents the first instruction of the procedure linkage table entry. lwpid provides the lwp identifier and plt_base provides the base address of the procedure linkage table. These three variables provide information sufficient for various architectures to process the procedure linkage table. rpi provides detailed information regarding the procedure linkage table entry as defined in the following data structure, defined in rtld_db.h. Identifies how the procedure linkage table entry can be traversed. This method is set to one of the rd_skip_e values. Identifies how many instructions to step over when RD_RESOLVE_STEP or RD_RESOLVE_TARGET_STEP are returned. Specifies the address at which to set a breakpoint when RD_RESOLVE_TARGET_STEP or RD_RESOLVE_TARGET are returned. The procedure linkage table destination address, added with RD_VERSION3. When the RD_FLG_PI_PLTBOUND flag of the pi_flags field is set, this element identifies the resolved (bound) destination address. A flags field, added with RD_VERSION3. The flag RD_FLG_PI_PLTBOUND identifies the procedure linkage entry as having been resolved (bound) to its destination address, which is available in the pi_baddr field. The following scenarios are possible from the rd_plt_info_t return values. The controlling process sets a breakpoint at BREAK and continues the target process. When the breakpoint is reached, the procedure linkage table entry processing has finished. The controlling process can then step M instructions to the destination function. Notice that the bound address (pi_baddr) has not been set since this is the first call through a procedure linkage table entry. The procedure linkage table entry has already been resolved and the controlling process can step M instructions to the destination function. The address that the procedure linkage table entry is bound to is <BoundAddr> and the RD_FLG_PI_PLTBOUND bit has been set in the flags field. The default behavior of the runtime linker relies on the operating system to load dynamic objects where they can be most efficiently referenced. Some controlling processes benefit from the existence of padding around the objects loaded into memory of the target process. This interface enables a controlling process to request this padding. This function enables or disables the padding of any subsequently loaded objects with the target process. Padding occurs on both sides of the loaded object. padsize specifies the size of the padding, in bytes, to be preserved both before and after any objects loaded into memory. This padding is reserved as a memory mapping using mmap(2) with PROT_NONE permissions and the MAP_NORESERVE flag. Effectively, an area of the virtual address space of the target process, adjacent to any loaded objects, is reserved. These areas can later be used by the controlling process. A padsize of 0 disables any object padding for later objects. Note - Reservations obtained using mmap(2) from /dev/zero with MAP_NORESERVE can be reported using the proc(1) facilities and by referring to the link-map information provided in rd_loadobj_t. The imported interface that a controlling process must provide to librtld_db.so.1 is defined in /usr/include/proc_service.h. A sample implementation of these proc_service functions can be found in the rdb demonstration debugger. The rtld-debugger interface uses only a subset of the proc_service interfaces available. Future versions of the rtld-debugger interface might take advantage of additional proc_service interfaces without creating an incompatible change. The following interfaces are currently being used by the rtld-debugger interface. This function returns a pointer to a copy of the auxv vector. Because the auxv vector information is copied to an allocated structure, the pointer remains as long as the ps_prochandle is valid. This function reads data from the target process. From address addr in the target process, size bytes are copied to buf. This function writes data to the target process. size bytes from buf are copied into the target process at address addr. This function is called with additional diagnostic information from the rtld-debugger interface. The controlling process determines where, or if, to log this diagnostic information. The arguments to ps_plog() follow the printf(3C) format. This function searches for the symbol in the target process. The symbol named name is searched for within the object named obj within the target process ph. If the symbol is found, the symbol address is stored in sym_addr. The symbol named name is searched for within the object named obj within the target process ph. If the symbol is found, the symbol descriptor is stored in sym_desc. In the event that the rtld-debugger interface needs to find symbols within the application or runtime linker prior to any link-map creation, the following reserved values for obj are available. The controlling process can use the procfs file system for these objects, using the following pseudo code. Once the file descriptors are found, the ELF files can be examined for their symbol information by the controlling program.